Each year the Association of Internet Researchers brings individuals to our conference who focus on exciting and emerging areas of Internet research. We are very pleased for 2018 to present our members with a very creative keynote and a plenary panel with four innovative researchers. Jason Edward Lewis is a digital media poet, artist, and software designer. He is presently the Concordia University Research Chair in Computational Media and the Indigenous Future Imaginary as well as Professor of Computation Arts at Concordia University, Montreal. 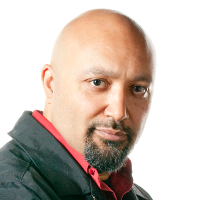 He founded Obx Laboratory for Experimental Media, where he directs research/creation projects devising new means of creating and reading digital texts, developing systems for creative use of mobile technology and using virtual environments to assist Aboriginal communities in preserving, interpreting and communicating cultural histories. Along with the artist Skawennati, he co-directs Aboriginal Territories in Cyberspace, Skins Workshops on Aboriginal Stortyelling and Video Game Design and the Initiative for Indigenous Futures. His other interests include computation as a creative material, emergent media theory and history, and methodologies for conducting art-led technology research. Lewis’ creative work has been featured at Ars Electronica, Mobilefest, Elektra, Urban Screens, ISEA, SIGGRAPH, and FILE, among other venues, and has been recognized with the inaugural Robert Coover Award for Best Work of Electronic Literature, a Prix Ars Electronica Honorable Mention, several imagineNATIVE Best New Media awards and five solo exhibitions. He’s the author or co-author of chapters in collected editions covering mobile media, video game design, machinima and experimental pedagogy with Indigenous communities, as well as numerous journal articles and conference papers. Lewis is a Trudeau Fellow, and a former Carnegie Fellow. He received a B.S. in Symbolic Systems and B.A. in German Studies (Philosophy) from Stanford University, and an M.Phil. in Design from the Royal College of Art. Born and raised in northern California, Lewis is Cherokee, Hawaiian and Samoan. Can/should we have a different internet studies as an trans/inter/discipline? The plenary format will be conducted so as to encourage sharply focused interventions around these questions as well to facilitate discussion and debate between the participants. Melissa Gregg is an international expert in the field of gender studies, cultural studies and affect theory and a commentator on the future of work. She is the author of several books, including Work’s Intimacy (2011) The Affect Theory Reader (2010) and Counterproductive: Time Management in the Knowledge Economy (Duke 2018). After a career in academia, Melissa joined Intel in 2013 to co-direct an academic center for social computing. She is currently a Principal Engineer and Research Director in Intel’s Commercial Client Group. Her research informs investments and user experience requirements across Smart Home and Business Client platforms. She is part of the core team preparing the company for the shift to ambient computing. Her research on coworking in Asia, Europe, the US and Australia has been critical for Intel’s future office vision, making workplace transformation efforts relevant for the growing gig economy. Guillaume Latzko-Toth is an associate professor of communication and digital media at Laval University (Quebec City, Canada) where he is also the associate dean for research, creation and graduate studies in the Faculty of Humanities. He is a founding member and codirector of the Laboratory of Computer-Mediated Communication (LabCMO) and a member of the Interuniversity Research Center onScience and Technology (CIRST). After completing his PhD in Communication at the University of Quebec at Montreal (UQAM, 2010), he did a postdoctoral fellowship at the University of Illinois at Chicago (UIC) where he pursued research on the early days of social computing. Rooted in a Science and Technology Studies (STS) perspective, his research and publications address users’ contribution to the development of digital media; the role of artifacts in digitally-supported communities; transformations in publics and publicness; and methodological and ethical issues related to research in digital contexts. Besides a number of contributions to edited books and French-language journals, his work appeared in the Journal of Community Informatics, the Bulletin of Science, Technology and Society, the Canadian Journal of Communication, and Internet Histories. Alison Powell is Assistant Professor in Media and Communications at the London School of Economics and Programme Director of the MSc in Data & Society. Her research examines how people’s values influence the way technology is built. Alison started working with community wireless hacker communities in the early 2000s and now experiments with participatory and public engagement methods to investigate how we generate knowledge about technology, citizenship, and our futures. She currently spends time on two projects: VIRT-EU, a 2.5 million Euro Horizon 2020 project examining ethics in practice among Internet of Things developer communities where she is co-investigator, and Understanding Automated Decisions, a university-industry partnership with Projects by IF exploring how to design services to explain how algorithms work, where she is principal investigator. 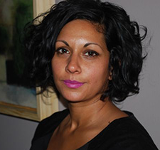 Sarah Sharma is Associate Professor of Media Theory (ICCIT) and the Director of the McLuhan Centre for Culture and Technology at the University of Toronto. Her research focuses on feminist approaches to technology with a particular focus on issues related to labor and time. She is the author of In the Meantime: Temporality and Cultural Politics (Duke UP, 2014). Sarah is currently working on a new book about technology and the gendered politics of exit and refusal. This new work fits within an ongoing research project at the McLuhan Centre concerned with invigorating McLuhan’s media theory via feminist technology studies.